Ordinary umbrellas are more designed to keep the users dry while the umbrellas stay open; however, when they are closed, the water held within the folds splashes around leaving the car and the rooms soggy, much to the embarrassment of everyone around. This is what makes reverse folding umbrellas highly useful. 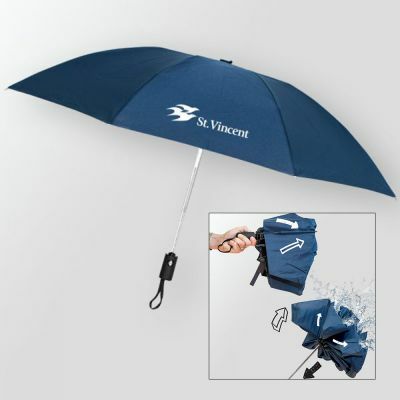 Great for cars and while on the move as they keep the users dry even while folding the wet umbrellas. Inverted Umbrella is a smart innovation that allows it to be opened and closed in reverse direction (inward folding), leaving it dry side on the outside. It keeps the wet surface inside the fold to avoid getting water on to you or your floors. This design was developed by a UK based engineer when his mother-in-law complained how her umbrella dripped all over the floor of her house. It will protect the users from getting wet while alighting or getting into your car; and also prevents spilling water all over the floor. Inverted umbrellas look like a regular umbrella though a bit heavier; and it has to be opened to dry out. 46 Inch Arc Promotional Renegade Auto Open/Close Inverted Umbrellas (PI31127) featured in this video are manufactured using pongee fabric and offered in attractive color variants. These auto open and close umbrellas feature matching sleeve and 46” arc. The Inverted ribs push the rain away and keep the users dry. Compact and easy to carry, these promotional umbrellas are excellent gifts for your clients and vendors. Make use of the generous imprint area on the solid colored canopy to highlight your message; great value added gifts to promote outdoor events, tradeshows and store promotions. Order these custom printed giveaways right now to grab our free design, free online proofs and fastest turnaround time offers. Did you find this product video useful? Do share it across your favorite platforms and spread the word.